The fast-changing world of building flat-panel TV sets looks likely to take another twist if rumours about Sony's plans prove true. Leaks from the Tokyo company suggest that Sony will set up shop with arch-rival Sharp within a few weeks to use its LCD panels in new Bravia televisions. As Sony already has a joint LCD venture with Samsung and Sharp supplies the glass panels needed for all flat TVs to Toshiba, competition in the increasingly lucrative television business is far from clear. Sharp, which has its HQ in Osaka in west Japan, already has commitments to building the world's largest LCD factory by 2010 and has long been the leader in manufacturing the panels used in all forms of flat displays. 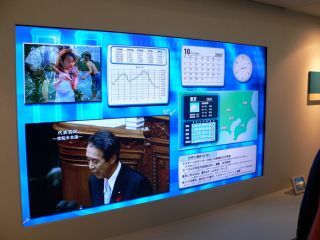 At stake for the circling players is an LCD television market that will see sales of between 150 million and 200 million sets worldwide by 2012.